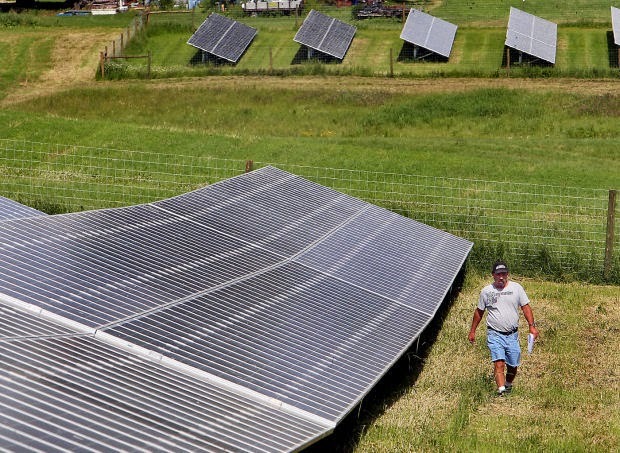 Merlin and Trudy Simonson have long been interested in solar energy. They wanted to put solar panels on their home in Genoa but were “afraid we’d do it wrong,” said Merlin, a retired Department of Defense worker. So when their utility, Vernon Electric Cooperative, offered a chance to buy panels in a solar farm, they jumped. They expect their investment will offset about 80 percent of their electric bill, which includes heat for their Genoa home. Both are among 120 owners of the community-owned solar array, the first of its kind in Wisconsin. The solar farm, which went online in May but was formally unveiled in a ceremony Thursday, was largely a response to member interest, said Dave Maxwell, Vernon Electric’s marketing and communications director. “We had a pretty good hunch that something like this would work,” Maxwell said. Vernon Electric was able to piggyback on a project by La Crosse-based Dairyland Power Cooperative, which serves the Westby utility and built a 500-kilowatt array that should provide enough power for about 60 homes. The developer, Colorado-based Clean Energy Collective, took advantage of federal tax credits, and the co-op kicked in a $71 rebate to bring the cost for members down to an even $600 per 305-watt panel — or about $2 per watt. The panels are under warranty for 25 years but will likely last for 50, Maxwell said. Panels were available to members of the co-op, who could purchase only as many as would offset their power use. Members own their panels, though the co-op takes care of maintenance. Computer software tracks the electricity fed into the grid and calculates the credits. They can keep their panels so long as they live in the co-op service area, and panels can be bought and sold among members. Richard Case wanted to get in on the action but the panels sold out in only two weeks. Case said it would be impractical to install panels at his Ontario farm, which is tucked in a valley, but he’d like to be part of the move away from fossil fuels. Clean Energy founder Paul Spencer acknowledged that coal remains the cheapest fuel per kilowatt hour, but solar is becoming increasingly economical as equipment costs have fallen by half in just the last five years. Today’s panels produce about 30 percent more electricity than they did then. U.S. solar installation in the past two years has outpaced the previous three decades, according to the Solar Energy Industries Association. In 2013 alone, the nation added 4.7 gigawatts, more than 60 percent of the existing capacity. As volume increases, Spencer said, prices will become even more competitive. Unlike coal plants, there’s no ongoing fuel costs for solar farms. And unlike wind, which tends to die on the hot summer afternoons, solar panels perform best when demand is highest. Zeke Skarlupka and his wife, Kelly, purchased 20 panels, which they expect will cover all their electricity use once they convert to a natural gas water heater. Living in Genoa, home to one of Dairyland’s two coal-fired plants, Skarlupka is well aware of where his electricity comes from.